Keno fanatics found the best venue to enjoy this game, and it is none other than Tropezia Palace Casino. 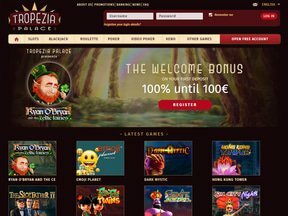 Tropezia has gained its popularity in the gaming industry since it has been established in 2010. The gaming site features a remarkable collection of keno variants and other games developed by BetSoft, Microgaming, Sheriff, and Rival. Players can choose among the 700 games, wherein 15 of them are Keno variants to be played instantly. These games offer not only entertainment but also superb quality. Since the site's software providers such as BetSoft and Microgaming, have great reputations in the field, customers can expect to get superior class of games. Upon paying the initial deposit, the first-time players can get a 200% bonus with a maximum of $200. The received free credit is subject to some wagering requirements. In order to withdraw the winnings out of the bonuses, players must bet the 100% of the bonus in keno games. Players should also bet using the free credit for 35 times. Before availing the sign-up promo, players are advised to consider the odds in playing keno and the high wagering requirements. Keno's house edge is at 4% so chances of losing are quite high as you wager for 35 times. As an alternative to the sign-up promo, there are other regular bonuses with lower wagering requirements. Every deposit made on Fridays is matched with 100% credit up to $100. During Tuesdays and Wednesday, men and women respectively receive 40% match credit for every deposit. The match up credit can increase up to $100. All these promotions are subject to 12 to 15 times of wagering requirement, depending on the promo. In terms of money transfer methods, Visa, MasterCard, Skrill, Ukash, and Paysafe Card are accepted. Unfortunately, Tropezia Palace does not accept payments coming from InstaDebit. Players need to wait for 48 hours in order to successfully take home their winnings with a minimum of $100. Withdrawals from the gaming site are only allowed during weekdays and required $5 processing fee. Tropezia Palace's customer service is also commendable. In fact, the gaming site is known to have accommodating and friendly support representatives. Tropezia agents properly assist their customers so rest assured that a player's issue can be immediately addressed and resolved.